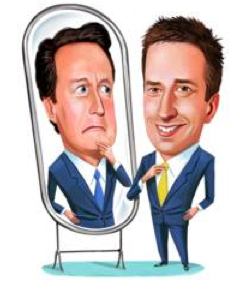 My seventh column for ConservativeHome — The Other Side — ran yesterday. You can read it here, as well as the always interesting comments below-the-line (which I try and respond to). My thanks to the site’s editors, Paul Goodman and Mark Wallace, for giving a Lib Dem space to provoke … constructively, I hope. At first glance, Angela Merkel’s victory in the German elections is good news for the Conservatives. At second and third glances, not so much. Take all these glances together and I’m left with only one logical conclusion: that I should, for the first time in my life, vote Tory at the next general election. Let’s start with the first glance. A centre-right leader, propped up in power by a small liberal coalition partner against the backdrop of a fragile economic recovery, wins an election and proves it is possible for an incumbent governing party to increase its share of the popular vote. If you’re David Cameron, what’s not to like? Ever since he failed to win outright against the sitting target that was Gordon Brown, the Tory leader has been nagged by critics (internal and external) pointing to an historical fact: no post-war party leader has managed to serve a full term and also up their vote-share. Not even Margaret Thatcher in her 1983 landslide (seats up, vote down). And if The Lady couldn’t do it, what hope has the pusillanimous Mr Cameron? Yet unless he does it, he will be faced with a Hobson’s Choice of a second term coalition with the Yellow Peril — or, worse, so much worse, a minority government in which he has to plead week in, week out with his own Awkward Squad of Bone, Carswell and Hollobone. But now the German ‘Mutti’ has shown it can be done. Moreover, she’s done it by squeezing the centre-left Social Democrats and squashing the liberal Free Democrats. Again, I ask: if you’re David Cameron, what’s not to like? Time for that second glance. Chancellor Merkel, though tantalisingly close to an absolute majority in the Bundestag, will need to form a coalition to govern. If either the Free Democrats or the anti-Euro Alternative for Germany had passed the 5% threshold and won any seats it would have been pretty straightforward. As it is, another ‘Grand Alliance’ beckons, with the Social Democrats rewarded (probably) with the foreign ministry. This will clearly impact on David Cameron’s much-vaunted renegotiation strategy leading up — if the Tories win — to the 2017 in/out referendum on the UK’s membership of the European Union. As Open Europe’s briefing points out, the Social Democrats have no problems with the idea of “repatriating competences”, but they do believe in securing the primacy of social rights over market freedoms. All of which should give Mr Cameron and William Hague plenty of scope for bartering. Chances are they’ll be able to scrape together enough haggled victories — some actual, more symbolic — to feel they’ve won a good deal for the UK that can be put before the British electorate. And that’s when the Conservatives’ problems will really begin. So here’s my third glance. The more likely it is that negotiations will conclude satisfactorily, the greater will be the tensions within the Conservative Party. After all, the party is riven, top to bottom, between the pragmatists and the purists. The pragmatists reckon the UK is, on the whole, better off in the EU (with a bit of tweaking). No amount of ‘tweaking’ will satisfy the purists, though — they’ll settle for nothing less than the UK’s complete withdrawal from the EU. Mr Cameron’s referendum has bought him some time, but only some. The crunch moment is a little bit nearer today. The pragmatists (and Mr Cameron is the Über-Pragmatist-in-Chief) will hope for make do and mend; the purists will pray for rupture and rapture. I don’t know who’ll win, but I reckon I know who’ll lose: the Conservative Party. David Cameron has “done an Angela”. He has proved the critics wrong, winning the election outright with the slimmest of working majorities. Within 18 months he returns from his latest piece of shuttle-diplomacy to declare that he has secured a triumph, winning vital concessions that mean he can “look the British people in the eye and say with hand on heart that British membership of the EU is, most definitely, in our national interest”. A referendum will now take place, he declares, and he, David Cameron, will be urging a Yes vote: “This is our chance to give a glad, confident yes to Britain’s ability to lead Europe, to reform it and make it work for the benefit of decent people”. Overnight, the polls — which, until now, had shown a majority wanted the UK out — swung in favour of keeping the country in the EU. The referendum proved a formality, a clear 2:1 majority backing what became known as “Dave’s Deal”. The only party to mount a concerted campaign against membership was Ukip, whose numbers were later swelled by a large-scale defection from Conservative MPs. They declared themselves implacably opposed to Britain’s continuing EU membership, accusing the Prime Minister of “selling out and betraying” the British people. Mr Cameron, liberated of the need to placate his party’s right-wing, immediately made a “big open and comprehensive offer” to the Lib Dems to join him once again in what he promised “will, this time, be a liberal Conservative government, a One Nation Coalition”. The Lib Dems, at the time of imagining this scene, were still drawing up their list of policies before deciding whether to join forces and “restore this government to the liberal mainstream”, as Nick Clegg put it. Fanciful? Maybe. Plausible? That too. But if I thought my vote could make it happen, then my pencil would find itself hovering with intent over the box marked Conservative in 2015.